ISRAEL: Activists Block Highway In Unprecedented LGBT Workers Nationwide Strike Over Surrogacy Laws - Joe.My.God. Protesters briefly blocked the Ayalon freeway in central Tel Aviv on Sunday morning amid demonstrations across the country, as the LGBT community began an unprecedented nationwide strike in protest of Israel’s failure to include gay couples in its surrogacy laws. The main southbound artery through the city was temporarily blocked by thousands of marchers waving the rainbow flag of the pride movement. In Jerusalem hundreds of demonstrators gathered near the prime minister’s residence, waving Israeli and rainbow flags. There were also demonstrations in the northern cities of Haifa and Carmiel and the southern city of Beersheba. 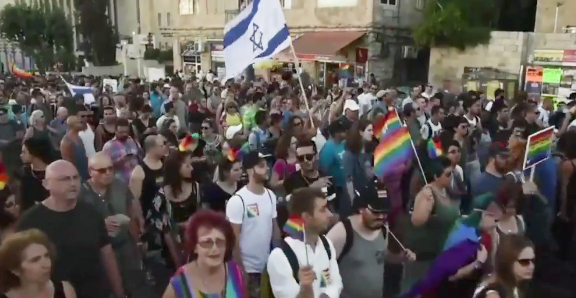 The LGBT community’s umbrella organization, The Agudah, set up protest tents on the central Rothschild Boulevard in Tel Aviv, where community members from the business, academic, and press sectors gathered. Many members of the community were striking throughout the country, often with the backing of their employers. Some of the companies who expressed their solidarity with the LGBT community’s protest include pharmaceutical company Teva; communication companies Bezeq, Cellcom and Motorola; TV providers Yes and HOT; Facebook Israel; credit card companies such as Leumi Card and Isracard; pharmacy company Super-Pharm; Clal Insurance; airlines El Al and Israir; construction engineering company Electra; supermarket chain Sufersal and many others. In addition, the The Nature and Parks Authority will allow LGBT members of its staff to attend the march. Ichilov Hospital at the Tel Aviv Sourasky Medical Center also joined the list of LGBT community supporters, allowing all employees who wish to participate in the upcoming protests to be absent from work. “In light of the requests from gay member of our staff and in solidarity with the community’s struggle for equal rights, the hospital will allow its employees, who wish to participate in Sunday’s demonstrations, to be absent from work,” said the official statement. Some believe that today’s action is the first LGBT-specific worker strike in the history of the world.